Giancarlo Stanton has played at a Bonds-ian level of late. To say Giancarlo Stanton is on fire would be an understatement. In August alone, the Miami Marlins right fielder hit 18 home runs; 61 qualified hitters have hit fewer than that this entire year. He averaged a 1.332 on-base-plus-slugging percentage with a dinger in almost one-sixth of his plate appearances. With about three weeks left to play, Stanton only needs to hit eight more bombs to cross the still-cherished threshold of Roger Maris’ 1961 single-season home run record. But what he’s done in the last month has exceeded almost all precedents. You have to go back to 1937 to find an August with as many home runs as Stanton just knocked. And the only players to have hit better than him relative to their league tend to have names like Babe Ruth, Rogers Hornsby, and Ted Williams. With such lofty comparisons, it would figure that pitchers might have the good sense to adjust their tactics. And it turns out that opposing throwers have stopped feeding Stanton strikes altogether. Based on the height, position, and count of each pitch, over the course of the month, fewer than 40 percent of the pitches thrown to Stanton were likely to be called strikes.1 In a testament to the pitchers’ fear, the majority of the pitches Stanton was seeing were well outside of the zone. To his credit, Stanton did adjust his swing rate at the same time, hacking less and letting the outside pitches sail by.2 Even though his walk and strikeout rates didn’t improve, Stanton was able to keep his rate of hittable pitches about the same by turning the count to his advantage: When hurlers are behind, they tend to throw more pitches down the middle. Since about 30 percent of his pitches came in hitters’ counts in August, Stanton ended up swinging at pitches about the same distance from the center of the strike zone as his season-long average. Whatever the pitchers were intending to accomplish, it did almost nothing to neuter Stanton’s production: He concluded the month with seven home runs in the last two weeks, a bit lower than the rate he accrued in his first two weeks. Pitchers also haven’t waved the white flag and given Stanton the Barry Bonds treatment, despite Stanton’s overwhelming production. Stanton has only accrued 11 intentional passes this season — by comparison, Bonds averaged 71 a season in his reign of terror from 2001 to 2004. But this is more likely chalked up to evolving baseball philosophy than intimidation. Intentional walks have been on the way out ever since sabermetrics declared them a bad move. The more perplexing aspect of Stanton’s power surge is how his approach as a hitter hasn’t changed — unlike several other hitters who have adjusted their swings in this current live-ball era. Hampered at times by injuries, Stanton’s always been capable of this kind of dominance when healthy. He slugs the ball harder than anyone this side of New York Yankees star Aaron Judge: He has the second-hardest hit ball of the season, along with the seventh-highest average exit velocity. But while Stanton’s exit velocity in the last month has been superlative compared to the rest of the league, it’s only about average for him. And there’s no sign that Stanton tweaked his swing to drive the ball upward, which might also explain a boost in home runs. Stanton has also maintained a consistent flat swing path that turns batted balls into line drives, the most productive kind of contact. So what explains the miraculous boost in production? A lot of luck. 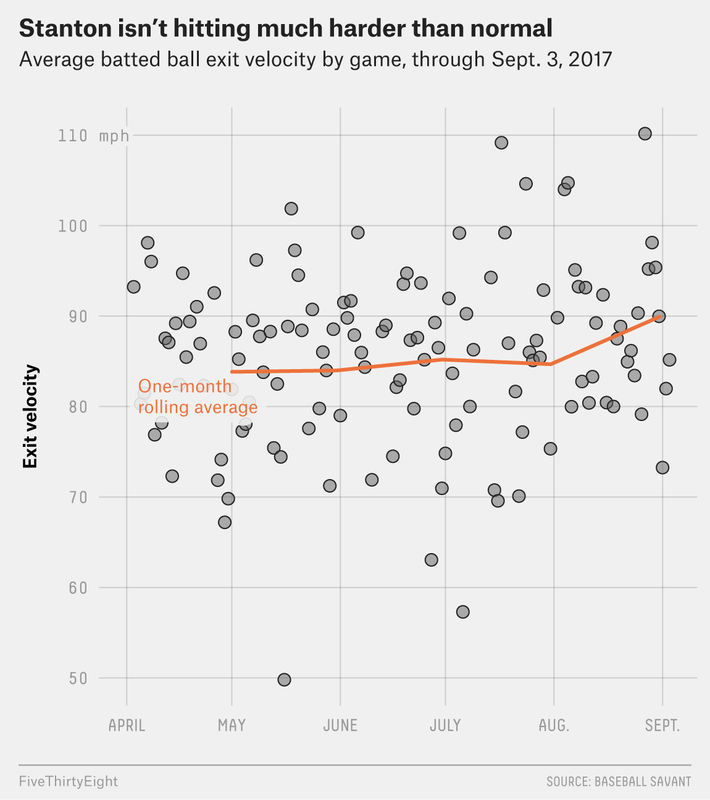 This August, about 35 percent of his fly balls made it over the fence, without a corresponding bump in exit velocity. Considering his career-long average is only 26.8 percent, the spike in home run rate might have more to do with favorable wind, temperature, and fences than something Stanton himself did.4 Over the course of a hundred plate appearances, it only takes a handful of favorable gusts or unusually warm days to turn regular Stanton into record-breaking Stanton. Stanton’s insane hitting will likely fall back down to earth, as most luck-driven performances do. Already, September is showing some signs of regression: His OPS has tumbled to only 0.708, and he’s only hit two home runs in six games (gasp!). But that has less to do with pitcher adjustments and more the natural ebb and flow of luck. It’s tempting to dismiss Stanton’s performance as a fluke. In fact, Stanton’s August performance is a testament to how close he’s always been to all-time greatness. If all it takes is a hundred plate appearances of good luck to elevate him to Bonds-ian levels of production, he was already an amazing hitter. We defined a pitch as likely to be a called strike if its called strike probability exceeded 0.5. 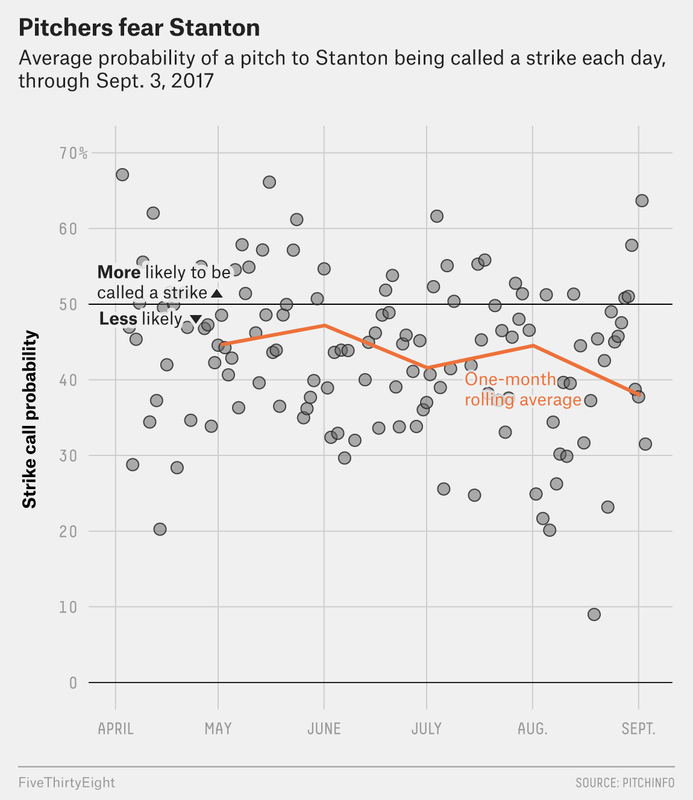 Called strike probabilities are calculated by PitchInfo. His overall rate of swings against all pitches declined from 43 percent to 38 percent. According to the numbers at FanGraphs, Stanton had walk and strikeout rates of 11.0 percent and 24.4 percent in August, versus 12.3 percent and 23.8 percent for the season. Possibly because of changes to the baseball, the leaguewide home run per fly ball rate has also jumped, which may be contributing to Stanton’s numbers.